Confort and quality above all! Its neutral colour matches easily all the bed linen themes. 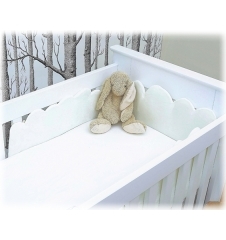 This Crib Bumper is made in Belgium out of a material which has been selected for its confort and respecting a severe quality chart. This material comes also in other products to create a complete unic and qualitative space in the baby room. 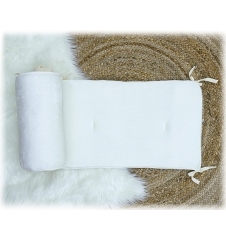 The Milky Cloud Cushion is made out of an extra soft velvet and with a very qualitative filling. Its neutral color makes it very easy to integrate it in the room decoration and for sure you will not stay indifferent to the softness. This Cushion is made in Belgium out of a material which has been selected for its confort and respecting a severe quality chart. This material comes also in other products to create a complete unic and qualitative space in the baby room. 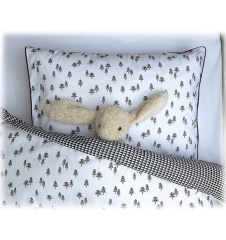 The Pine Forest Duvet Cover is made out of coton which is oeko-Tex certificated, with an extra soft lining and a pillowcase. 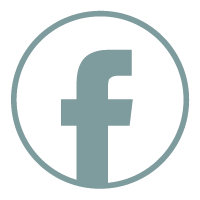 The Duvet Cover is made in Belgium out of materials which have been selected for their confort and respecting a severe quality chart. The Mille Fleurs Blanket is 100% cotton made, with a very soft lining in teddy material and a qualitative finishing. It has been designed to protect babies from draught or just to have a moment of cocooning in your arms. It also can decorate your baby's bed. It has been made in Belgium with materials selected for their confort and with respect for a severe quality chart. The material of the Mille Fleurs blanket has also been used for other products to create a complete and unique space. The Cobalt Blanket is made with a very soft lining in teddy material and a qualitative finishing. The material of the Cobalt blanket has also been used for other products to create a complete and unique space. The Sailor Blanket is coton Oeko-tex certified made, with a very soft lining in teddy material and a qualitative finishing. The material of the Sailor blanket has also been used for other products to create a complete and unique space. 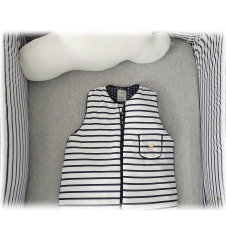 The Sailor Sleeping Bag is made in coton, with a soft lining certificated Oeko-Tex and a very qualitative fine filling. The Sleeping Bag has been made in Belgium with materials which have been selected for their confort while respecting a very severe quality chart. This material has also been used for other products to create a complete unic and qualitative space in the baby room. The Mille Fleurs Sleeping Bag is made in coton, with a soft lining certificated Oeko-Tex and a very qualitative fine filling. 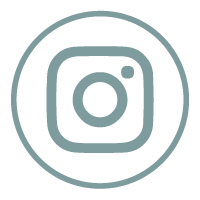 The Cobalt Sleeping Bag is made in coton, with a soft lining certificated Oeko-Tex and a very qualitative fine filling. 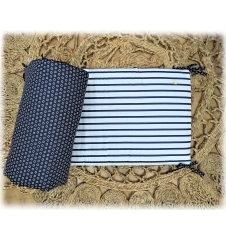 The Sailor Changing Mat Cover is made of certificated Oeko-Tex coton , with an extra soft central band for the dyper changing and a strechy lining which makes it easy to fit the cover on your mattress cushion. It has been made in Belgium out of materials which have been selected for their confort and respecting a severe quality chart. The Sailor Crib Bumper is made with an extra soft cotton and provided with a qualitative rigid filling.